Family: John Hunter was deeply inspired by his father, a statistician, as well as statistician George P.E. Box. Jimena Calfa writes about being inspired by and learning about quality from her kids. Luciana Paulise remembers the quality lessons she learned from her mother. Professional mentors: Manu Vora remembers various mentors and thought leaders he encountered during his career. Lotto Lai blogs about first research supervisor. Bob Mitchell found inspiration from leaders at 3M. 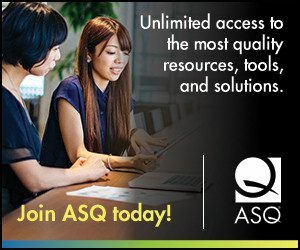 Chad Walters is inspired by fellow lean blogger and onetime ASQ Influential Voice Mark Graban, while Nicole Radziwill is inspired by a psychologist and an activist. Aimee Siegler finds quality inspiration in both her professional and personal life. Rajan Thiyagarajan learned four lessons in quality from his inspiration, a professor. Icons and beyond: Jennifer Stepniowski is inspired by Steve Jobs. Edwin Garro writes about quality lessons learned from a famous pediatric surgeon. Sunil Kaushik blogs about finding quality inspiration in an anonymous online forum and TED talk. And Pam Schodt wrote the intriguingly titled post 5 Keys to Quality Problem Solving I learned in a Pizza Delivery Store. Next Next post: Why Should Quality "Go Global"?